“Von Braun: Dreamer of Space, Engineer of War” is a hefty volume at almost 600 pages but through this rich detail the author Michael Neufuld (chair of the Space History Division of the Smithsonian’s National Air and Space Museum) manages to paint a brilliantly nuanced portrait of a man caught between morality and scientific progress, between his dreams of the heavens and the earthbound realities of his life. As one of the leading developers of rocket technology for the German army, Von Braun yielded to pressure to join the Nazi Party in 1937 and reluctantly became an SS officer in 1940. During the war, he supervised work on the V-2 rockets which were assembled by starving slave laborers in a secret underground plant and then fired against London and Antwerp. Thousands of prisoners died, a fact he knew all to well but kept silent about for as long as possible. When the Allies overran Germany, von Braun and his team surrendered to the Americans in a tactical move because he thought they would be willing to finance further rocket research. The U.S. Army immediately recognized his skills and brought him and his colleagues to America to work on the development of guided missiles. Handsome and likable, Von Braun dedicated himself to selling the American public on interplanetary travel and became a household name in the 1950s but he never fully escaped his past and in later years faced increasing questions as his wartime actions slowly came to light. 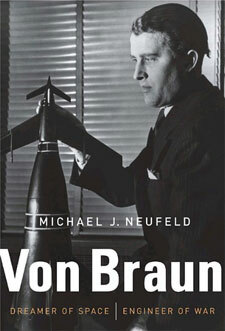 Von Braun’s main skill was not primarily in engineering or nuts and bolts rocket design, (many people contributed to those efforts) but as a man with a bold vision who could inspire the public and politicians while having the ability to manage giant military-industrial organisations to achieve his goals. 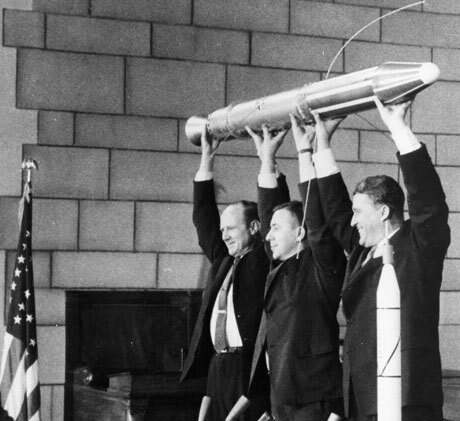 The first United States earth satellite “Explorer-I” was sent aloft supposedly as part of the United States program for the International Geophysical Year 1957-1958. However in reality it was a reaction to the launch of the first ever artificial Earth satellite, the USSR’s “Sputnik I”, on 4 October 1957. This “Jupiter-C” rocket was a special modification of the Redstone ballistic missile designed, built, and launched by the Army Ballistic Missile Agency (ABMA) under the direction of Von Braun. The Redstone in turn was a direct descendant of the German A-4 (V-2) rocket . Without his research on the V2 rocket and its predecessors there may not have been a space race between the USA and USSR. Once in orbit, the cosmic ray equipment of Explorer-I indicated a much lower cosmic ray count than had been anticipated. Dr. James Van Allen theorized that the equipment may have been saturated by very strong caused by the existence of a belt of charged particles trapped in space by the earth’s magnetic field. The discovery of these Van Allen Belts by the Explorer satellites was considered to be one of the outstanding discoveries of the International Geophysical Year. Von Braun, a hero to many for his work as technical chief of the Army’s missile program and later NASA’s space program, began a concerted effort in the 1950s to sell the idea of space travel to the American public. That included the collaboration with Disney on three highly popular space-related television films. “He had the ability to take this interest in space exploration and take it to the public”, said Mike Wright, staff historian for the Marshall Space Flight Center. Von Braun’s work on the Disney films and the Collier’s series sold many Americans on the idea of space flight and helped ensure adequate funding of the space program, said Wright. 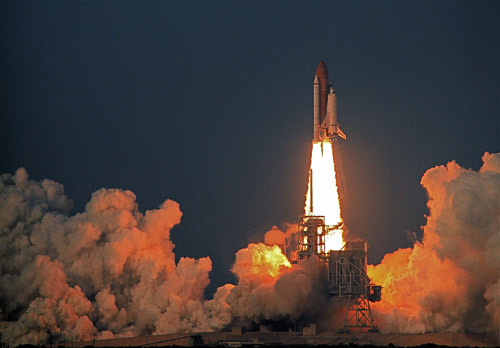 The German scientist’s personality was important for the success of the space program, said Michael Neufeld, a curator at the Smithsonian Institution in Washington who wrote a book about von Braun and his rocket team. “He was very charming, he was very charismatic”, Neufeld said. Von Braun’s talent was that he could communicate a vision of space travel in layman’s terms while bringing to the message the authority of a scientist. View all of “Disney’s Man in Space” parts: 0 1, 2, 3, 4, 5, 6, 7, 8. The Saturn V was a multi-stage expendable rocket used by NASA’s Apollo and Skylab programs from 1967 until 1973 under the direction of Wernher von Braun. NASA launched 13 Saturn V rockets with no loss of payload. It remains the largest and most powerful launch vehicle ever. Even at the tail end of his career Von Braun had great influence in setting up NASA to survive long term as a scientific organisation with a reliable and relatively cheap shuttle to ship satellites, space telescopes, astronauts and cargo back and forth from earth orbit. Von Braun envisioned huge spacecraft sending legions of humans to the moon and to Mars. The craft would be assembled at huge wheel-shaped space stations orbiting the Earth. While Von Braun did not envision the space station as a freight terminal, he did see the need for a fleet of piloted space cargo carriers to ferry up supplies and crews for the outpost itself and for the long missions to Mars etc that would begin there. NASA tried to settle for the shuttle/station combination, but the timing was terrible because America was mired in an expensive war in Vietnam so by 1970 all that remained of Von Braun’s grand scheme for putting footprints on Mars was the shuttle. In the end Von Braun’s goal was manned spacefight and if helping to create weapons of mass destruction in the form of V2 rockets for Hitler and Intercontinental ballistic missiles for the USA would get him there than he was willing to work with whoever would finance his research and testing. The reader is left to make their own conclusion asto whether achieving this goal required making a Faust-like bargain with the military forces who financed him. I am so glad to read some non-skeptical things about NASA and space exploration. I had to spend the weekend hearing about the moon landing hoax, which I think is utterly ridiculous. Glad to learn a bit more about Werner Von Braun too, as my only knowledge of him comes from the movie, October Sky. As private enterprise moves to the forefront in the race out to space, NASA will get renewed attention for the groundbreaking (space breaking?) role it has had in getting everything going. A really good mini-series documenting the space race and showcasing the accomplishments of Von Braun is Space Race. It was produced by the BBC in 2005.. Episodes can be found online if you look hard enough.